Heat oven to 180C/160C fan/gas 4. Toss the vegetables with the oil and some seasoning in a large flameproof roasting tin. Place the bird on top of the veg, smear with 1 tbsp butter and lay the rashers in a row over the breast. Season generously, then roast for 40 mins. Remove from the oven and give the veg a stir while adding the garlic and thyme. Pour 200ml stock and the wine over the veg and return to oven to roast for another 40 mins until the bird is cooked through and the juices run clear. Remove the bird, place on a serving plate, cover with foil to keep warm and leave to rest. Turn the oven up to 200C/180C fan/gas 6 and roast the veg for a further 15 mins until tender. Remove the veg with a slotted spoon and transfer to the serving plate with the bird. Mix 2 tsp butter and flour in a small bowl to form a smooth paste. Place the roasting tin with all the cooking juices, plus any resting juices, on the hob. Whisk the paste and redcurrant jelly into the juices until dissolved, then add the remaining stock and extra seasoning, if you like. Bubble for a few mins until the sauce thickens. 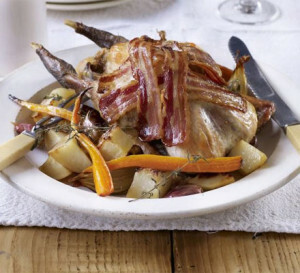 Slice and serve the guinea fowl, crisp bacon and the veg with the sauce on the side.